In 1887, officials of the Kansas City, Memphis, and Birmingham Railroad called for the survey of a railroad right-of-way connecting Birmingham, Alabama, and Memphis, Tennessee. Locating a point halfway between the two cities, the officials determined to start a town at that point named AMORY in honor of Mr. Harcourt Amory of Boston, Massachusetts. A town was platted with streets running parallel and perpendicular to the railroad track. To this day, this area is known as the Railroad Subdivision. In November of 1887, lots for businesses and residences were sold at auction, an event which attracted from near and far. Three miles west of the new town was a once-flourishing river town, Cotton Gin Port, the oldest town in Northeast Mississippi. At the close of the American Revolution, frontiersmen from the East and Southeast had fought their way into the area and established that town on the banks of the river where river trade and agriculture attracted additional settlers. Long before the coming of the white man, the Chickasaw Indians had established a village there on the banks of the Tombigbee River. Legend tells us that when the cotton gin was invented, President George Washington offered a gift to the Indians of a cotton gin, hoping to encourage the Indians in the direction of peaceful farming rather than warfare. The story goes that although the Indians did not like the cotton gin and proceeded to burn it, they did like the idea of the present and, as a matter of fact, were peaceful and friendly as they co-existed with the early settlers on the rich land and bartered for commodities from the boats coming up the river from Mobile. In 1837 these Indians were driven westward from the land by the government. Fifty years, a time that included the Civil War, passed. 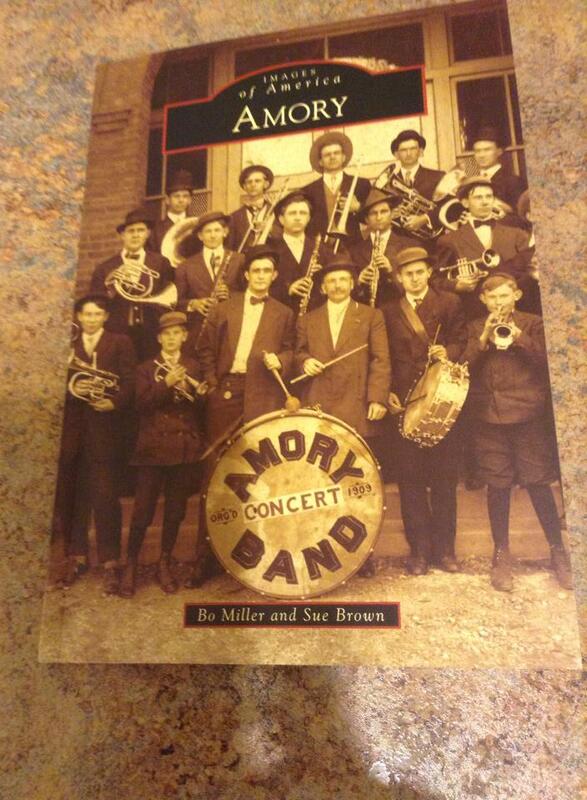 Having lost the Indian population and having lost many men to the war, the remaining population packed up and moved to the new town of Amory. Houses were put on logs and literally rolled into the new town or were dismantled and reassembled at the new location. In the early years, the streets were muddy and pine poles were sometimes laid across to provide passage. Newcomers arriving on the train would step onto a wooden platform surrounded by mud and water. 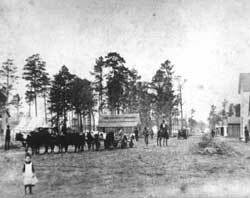 Wagons, buggies, or horses would approach to transport them, since foot travel was hazardous. Soon boardwalks were built. The Christian Church building had been moved from Cotton Gin Port and Methodists, Baptists, and Presbyterians organized early churches. A few businesses were established including five saloons. A landowner named Tubb plotted streets running north and south, east and west. Where these streets meet the railroad division streets, there are now in north Amory many angular intersections. In the early years a woman taught a small school in Tubb Town, while a man taught a class in a small storehouse. Soon a small frame schoolhouse was erected. 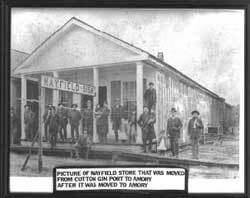 A hotel, general stores, a drugstore, a grocery, hardware and furniture stores, a bank, sawmills, cotton gins, and a compress were among the first establishments. Brick walks replaced board- walks, then graveled and graded streets appeared. Artesian wells were on almost every street. A doctor was among the earliest settlers. In 1904 an electric light plant was installed. A water filtration plan was built. The frame school was followed by a brick one which burned in 1914 but was rebuilt. In 1916 Gilmore Sanitarium, one of the first hospitals in this part of the state, was constructed. 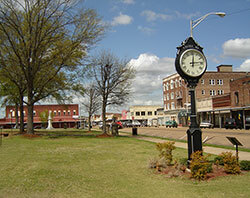 The citizens of Amory today enjoy wide paved, tree-lined streets, a refurbished downtown with canopied walks, several additional business areas, new subdivisions, several school buildings, over twenty churches, a progressive hospital with dozens of doctors, several manufacturing facilities, parks, community organizations, a museum located in the original hospital building, two golf courses, a library, two community centers, and numerous ball fields. The early history of the town is commemorated each spring with a Railroad Festival and an old train engine, the Frisco Park Steam Engine, is on display in the downtown park. While passenger service is no longer available, the Frisco Railroad operates in Amory along with the smaller Mississippian Railway. The Tennessee Tombigbee Waterway has brought water traffic and barges through Amory Lock and Dam. With a population of approximately 8,500, the town acts as a host for the many guests of a benefit concert designed to raise money for scholarships, a project called Entertainment for Education. Along with the many nationally known stars, in 1998, the town welcomed His Royal Highness, Prince Edward, for whom these historical notes were compiled, based on papers from the Amory Regional Museum and local folklore.